MICHAEL BUBLE on Regis & Kelly & Tree Lighting! 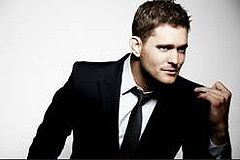 You probably have heard that Michael Buble’s new album “Crazy Love” continues to sell like hotcakes – hitting #1 on the Top 200 album chart its first two weeks out AND continues to be in the top 10 since its release on October 9, 2009. Buble is set to perform for the event, along with Aretha Franklin, Shakira, Barry Manilow, and Alicia Keys. The multi-Grammy winning artist hunkered down in recording studios in LA, Brooklyn, New York and his hometown of Vancouver for the last six months to make his "ultimate record about the inevitable roller coaster ride of relationships." The first single, "Haven't Met You Yet,” written by Bublé (with Alan Chang and Amy Foster) met with huge appreciation when it hit radio. Additional tunes on the album include "Cry Me A River,” "You're Nobody Till Somebody Loves You,” "Georgia On My Mind" and "Baby (You’ve Got What It Takes)" which was performed with Sharon Jones and The Dap-Kings. The title song is a cover of the Van Morrison gem "Crazy Love.” The CD closes out with a haunting version of "Stardust" which is performed with the acapella group Naturally 7. The album was produced by David Foster, Bob Rock and Humberto Gatica.